Use Bitly as a data source – How can we help you today? To create a data source using Bitly, go to the New Data Source page in Klipfolio and select the Web Accessible Resource option. For Type, select the OAuth Credentials option. Select from the list of OAuth service providers. Enter your Bitly name and password when prompted. Now you'll need to bring the query you crafted with the Bitly API Console into Klipfolio. At authentication Type, select OAuth Credentials from the drop-down list. 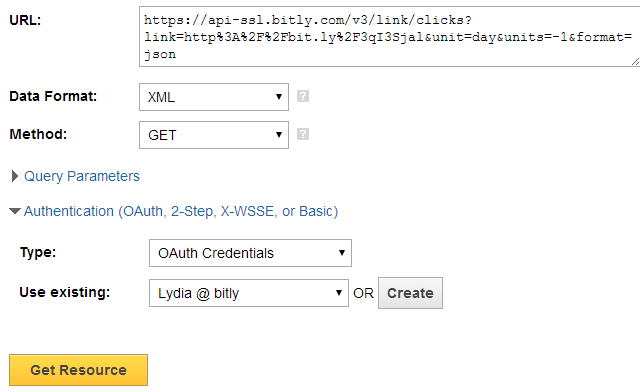 At Use existing, either choose your Bitly Oauth token from the drop-down list, or create a new one (see Step 2).